This is a short story I wrote for a competition but I was late finishing it and the competition closed before I could get it in. I hope you like it. A scratch at my door! A frustrated yelp! The sound of paws on wood! And then a great bark of joy as Buster forced his way in, his black tail wagging so hard that even his long ears seemed to shake as he half-wiggled, half-charged across my cold bedroom. My freezing cold bedroom. Daisy let out her best grown-up sigh, shaking her head as if I were the youngest, not her. 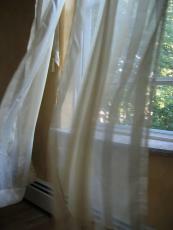 As if on cue, my curtains billowed in a strong gust of wind to reveal that Daisy was telling the truth. Buster shivered then slipped beneath my duvet. ‘I didn’t do it,’ I said. Daisy was about to argue, when something caught her eye: a piece of paper pinned to my wooden windowsill, the edges fluttering as the curtain flapped in the breeze. Daisy grabbed my arm, and for a few seconds, we did nothing but stare. Finally, my sister climbed to her feet then tiptoed forwards, slowly, slowly, as if the piece of paper was something dangerous. Holding her breath, she moved the curtain to one side then leaned forward to get a better look. “Time to go, Buster,” I said, running to my wardrobe and grabbing my bag out. I stuffed in underwear, a t-shirt and a blanket, plus my iPod and a random notebook with a pen. Once that was done, I charged around my room, pulling on a clean t-shirt, socks and yesterday’s dungarees. After finding my trainers and cramming my feet inside, I hunted down my brush and a bobble, dealt with my stupid hair and shoved the brush into my bag, followed by my thickest jacket. I tied my other jacket around my waist, hitched my bag onto my back, kissed Buster farewell and barrelled out of my window. Buster started barking loudly as I tore the note from its nail and stuffed it into my pocket, sliding down the roof. I hit the ground running, vaulted my fence and ran through the alleys behind my house. Slowly, Buster’s calls to me died out, and I burst through the continuous buildings and sprinted up the fields. After running full out for about ten minutes, I slowed up and collapsed into a patch of soft, warm grass. By now, Harry and Mum would have called the police and Harry would have called his ‘lads’ over and given them the job of finding me. Their most valuable piece of evidence, the note, was in my pocket, and I pulled it out now, reading it. It wasn’t that creepy-not like the rest had been- it was really a warning. To someone who hadn’t met the people I had, this would have been a first case creep-out. It had been the first time. I stuffed the note into my bag and started walking again. The first note had been posted through the door of my house. I was home alone: Daisy, Mum and Harry had gone clothes shopping together, and I was baby-sitting Buster. The dark isn’t as scary as it looks. The note had been tied to a torch, and I’d freaked out for at least an hour, with all the lights on and a phone in my hand. But as I was left longer alone with the note, I calmed down and common sense began to kick in. By the time my family had gotten home, I’d turned all the unneeded light off, and the note was safely hidden under my floorboards, along with the torch. The second I’d found stuck to the inside of my desk at school; we had those single, old fashioned American style desks. I’d been calm and surprisingly pleased to see it; it reminded me I wasn’t going mad about the other note, and it clarified it wasn’t one of Harry’s pranks. Maths is difficult, right? Just try hard. No one ever called me Emilia, not really. No one could really say it, except me. They all called me Emy, or sometimes Emily if it was a new teacher. So this person must really know me to know that. The third was inside my bag. I was looking for my phone, and I’d found the note wrapped around it. Your phone’s a dangerous thing to lose. That was a little scary, and I’d looked out of the window twice to try to see who it was, but no one was anywhere near our house, not even in the alleys. Our house is nicknamed the Maze, because of its connections to the alleys. Mum has always wanted to move, but we never have. We were all born here, me and my siblings, and I have the feeling we won’t ever leave. But I plan to go travelling when I’m old enough; people think that travelling alone at fourteen is dangerous. The last one before this was laid on my pillow near my head when I woke up. You should look out of your window more often. I’d naturally looked out my window, and I’d even gone out and had a look around. But I hadn’t found a thing. This person, the person writing the notes, must know of us, I had concluded. Who else would know where we live, who I am and which room is mine. But I hadn’t panicked at all, and the notes had all gone under my floorboards. Damn, I thought. The notes. Naturally, the police would search and they would be found. My family would learn of my dangerous secret. I might not see them again anyway. I had no idea where to go, but something seemed to be right as I headed over the fields around our town. My town was far behind now, and I wasn’t anywhere near a road. I checked my watch. 11:48. I’d probably gotten out the house about 10, so I’d been gone nearly two hours. My family would be frantic, and Harry may have joined his friends in looking for me. Mum would have gone into town with Daisy and Buster and they would be asking people if they’d seen me. I wondered if they would post up pictures of me around where we live. I wondered if I’d get onto the news eventually as the girl they never found. Though, I suppose younger kids tend to get on first. I wonder if they’ll find my will. I’d written it a few months ago. It basically said Daisy could have any of my clothes, and they could sell my stuff if they wanted to. Including my painting of the sea view from Lilli’s house, Daisy’s friend who lives near the coast. We’d gone about a year ago at Christmas, and I’d drawn and painted the view because I’d loved it so much. My journey lasted forever. I walked over fields and roads. I ignored people if they called, ran if they tried to follow. Police cars passed the fields I was walking across a few times, and a few even got out and started calling to me, but I kept on walking. At about four pm, my phone started ringing. It had during the day, and I’d been tempted to drop it in a few fields. But as I raised it to check it, I saw the caller ID. I answered it, unable to believe my eyes. “Where are you?” I asked, confused. I could hear the distant sounds of people talking to him, and Mum’s voice demanding to talk to me. He disappeared not long after my 8th birthday, and had never tried to contact me since. “Well, there’s a lie,” I replied snappily. I was probably being mean about this, but that man had left us to cope on our own, and now he was saying he cared? Unbelievable. They already have, Emy.” Dad’s voice was soft, sad. He knew I was going. I let the phone slip through my fingers, my dad’s last desperate reply fading as it fell away from me. I left my phone lying in a random field, the last note wrapped around it. Plus another. You may never see or find me, but I will see you. © Copyright 2019 Katiebelle13. All rights reserved.